Oriental cockroaches mostly live in moist areas, but can survive in dry areas if they have access to water. They prefer cooler temperatures around 70-80 degrees Fahrenheit. 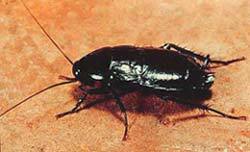 Oriental cockroaches can be found in basements, crawl spaces, cracks and foundations. They feed on a wide variety of plant and animal material.